Tucked away in the PAX Rising international section at PAX Australia 2016 was a peculiar game: a black and white representation of a 19th century sailing ship with barely any promotional material at the booth all. Indeed, the actually screen was obscured, and you basically had to be standing in the booth to see anything. It was definitely an unexpected showing. Compared to the dozens of other offerings bearing colourful displays and attracting attention, Return of the Obra Dinn was satisfied with sitting in the background, brooding mysteriously and standing defiantly apart from any other experience available at the convention. Developed by Lucas Pope of Papers, Please fame, this game is a murder-mystery adventure with some horror undertones in which players are exposed to the darkness of life on the high seas. 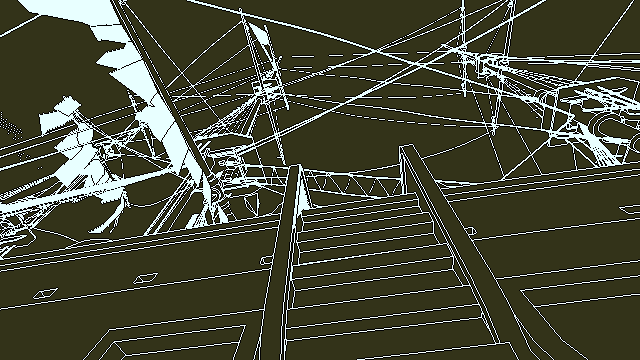 The Return of the Obra Dinn is set on a fictional trade ship lost at sea and vindicated by history, with the player given the task of documenting just what happened to its crewmembers. The year is 1803, the East India Trade Company was expanding its dominance on the world and the Cape of Good Hope at the southernmost point of Africa was still a fickle and merciless passage for Englishmen tempted by the riches in Asia. When the remains of the ship floats deserted yet intact into port years after it disappeared, a dark story of betrayal and murder begins to surface. With a pocketwatch, the player is able to travel through time to the point of each character’s death in order to piece together the ultimate fate of the Obra Dinn’s crew. 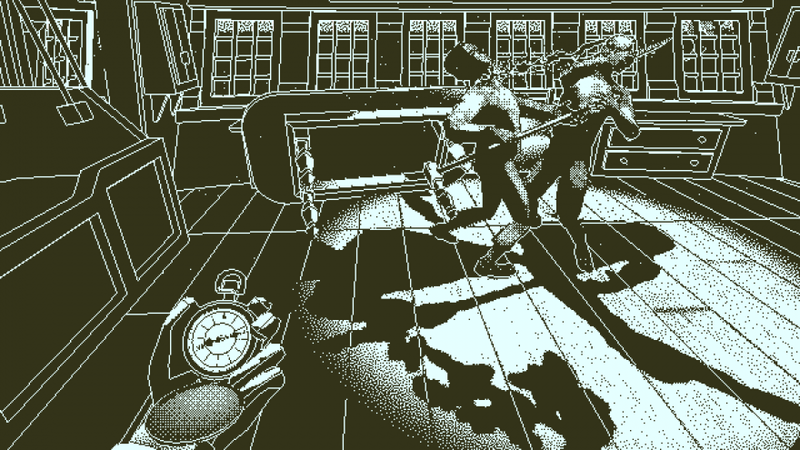 The game’s graphical style might just be its first selling point, as Return of the Obra Dinn looks wildly different from anything else available on the modern gaming market. 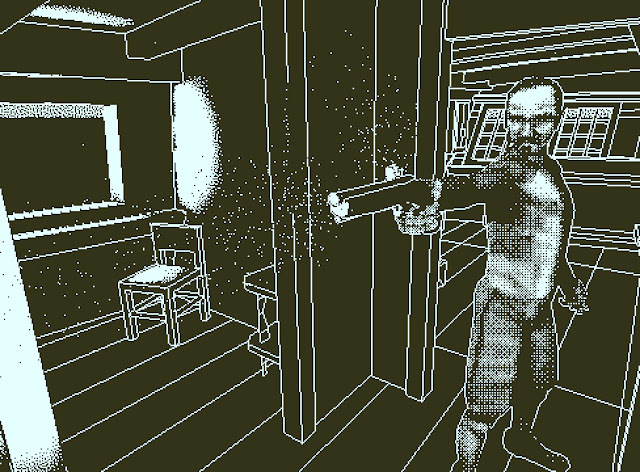 Taking cues from black and white Macintosh computer displays, the game’s art style is reminiscent of old, grainy photographs or crosshatched pencil sketches. Pope said that the style was decided upon very early into development, with everything from the naval setting to the dark storyline were built to accommodate the game’s looks. Thanks to some very clever location design, everything comes together nicely and the game’s dark environments effectively set the mood for a tale of nautical tragedy. The game’s temporal setting is an area of personal interest for Pope. Saying that he enjoys challenging himself to learn more about history and the world around him, Pope wants players to move away from the clichés of pirates and naval battles in order to really consider the reality of life on a trade ship. My time with The Return of Obra Dinn’s demo showed off the game’s historical lens: the player character is always an observer figure, never acting upon the environment, and the ship’s overarching narrative needs to be pieced together through snippets of information found while exploring. The sparse story definitely made me want to learn more about the time period and the real-life events which inspired the game, which is always a plus when engaging with historical fiction. From its inception, it’s clear that Pope is interested in developing a character-based narrative experience. As with Papers Please, there is a multitude of named characters differentiated by physical features, costuming and gesture, and the black and white aesthetic of Obra Dinn does not detract from the game’s ability to create visually distinct characters. Pope wants the player to become invested in the crew, to empathise with the plight of the sailors and to understand the effects of such a perilous lifestyle upon ordinary people. 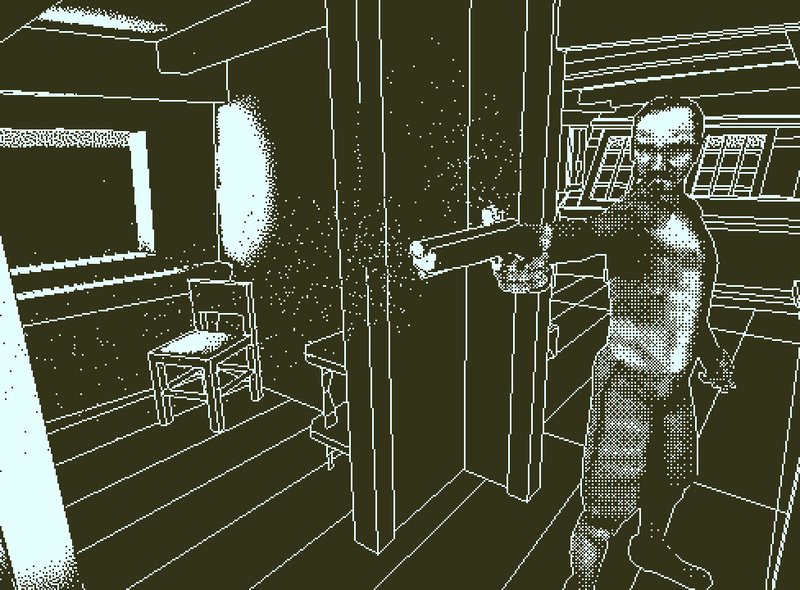 Being a game about death, Return of the Obra Dinn also has a fairly unique take on the representation of violence. Whilst the deaths in the game aren’t portrayed for immediate shock value, partially as Pope admits the graphical style is too abstract for violence to be visceral, there were definitely moments in the demo which made me stop and think. Perhaps it’s the fact that violence is portrayed as a frozen image: whenever travelling back in time to a sailor’s passing, the scene is perfectly still, so much so that blood erupting from wounds stays suspended in the air. The player character is able to move freely around these scenes and to see the life-ending blows or gunshots from 360 degrees. It’s an effect which is hard to explain until experienced firsthand, but as a grim, almost voyeuristic take on violence, Obra Dinn gives the player pause, forcing them to consider the morality of each of the game’s characters. Related reading: Matt's review of Lucas Pope's other game, Papers, Please. If there’s a consistent theme within Lucas Pope’s design, it’s that he wants the player to be constantly thinking. The Return of the Obra Dinn is a pure mystery game, one which never gives the player a full image of its narrative, but merely clues, abstractions and symbols which lead them on a journey to find their own conclusion. As with Papers, Please, it’s best to go into this one without any preconceptions. Its historical setting, graphical style and dark story makes it prime material for genre fans – I’m sure this is a game which will be appreciated for its uniqueness long after its release. The Return of the Obra Dinn is slated for release in 2017.